Patra's Other Place: Time flies when you're having fun. Guess I must be having fun, because I just do not know where my time goes. I'm one of those practical people who don't like to make a start on leisure activities until the housework is done. In fact I get a bit antsy if I get to the end of the day and I haven't done what I'd planned to do that morning. Isn't that a cute word - 'antsy'. I looked it up online to make sure I had the right word, and it does indeed describe how I feel on one of those days - fidgety, restless, agitated. I couldn't find out where it originated; could someone have watched ants scurrying around when their anthill has been kicked in? Getting sidetracked here. Sunday was one of those days. Ken decided on Saturday night that we should visit an old family friend (his side of the family) who lives in Korumburra, a Victorian country town about 124 Kilometres from Eltham (one and a half hours drive.) 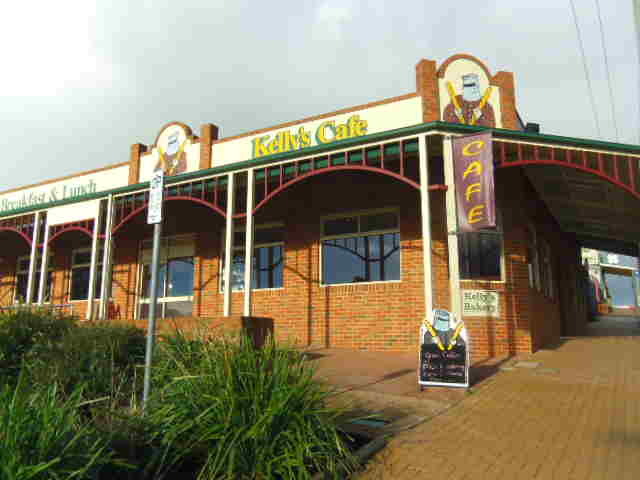 Ken's friend is looking after his parents' house until it is sold (his Dad is in aged care). It is a stunning home, on 22 acres. 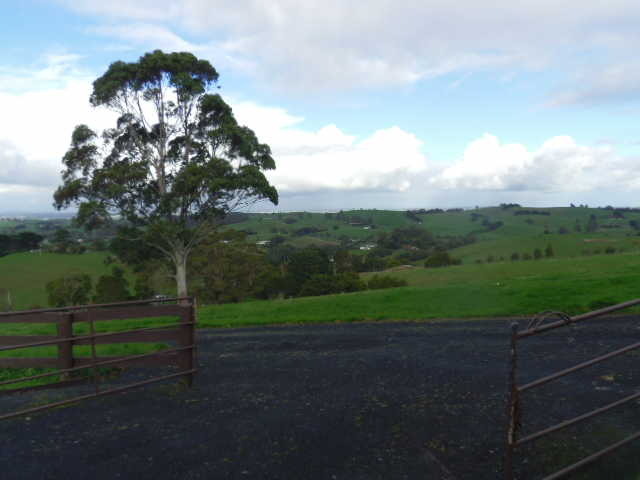 Just have a look at these views....at a selling price of $670,000 we could just about afford to buy it, but we couldn't maintain a place that size now. Twenty years ago, yes, but we didn't have the money then. Looking down the main street in Korumburra. 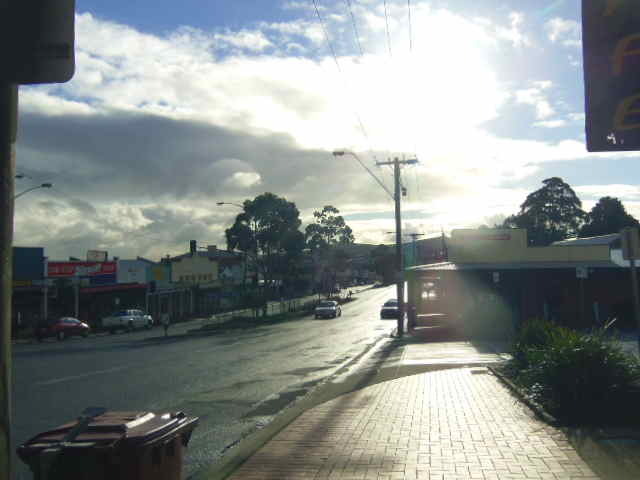 Just a quiet little country town. Great place to retire. We stopped at this cafe/bakery for a coffee and cake, and bought a meat pie to take home for tea. It was one of the best meat pies we'd ever tasted! Korumburra is prime cattle grazing land. 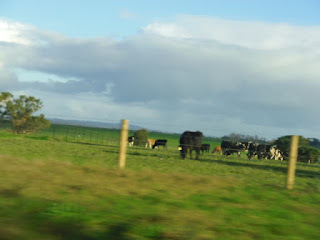 Most of the farmlands we drove past had cows in their paddocks. We left home about 9.40 am and got home about 6 pm. While it was a lovely day out, at the back of my mind I kept thinking about what I'd planned to do that day - three loads of washing, starting a small quilt for Ken, and a few other small jobs. When we got home, I put a load of towels in the machine. When they were done, I hung them outside on the line and put a load of clothing on to wash. when they were done, I put them in the clothes drier. Now this is something I rarely do, as those things chew up a lot of power, and generally speaking in most parts of Australia we can hang washing out on a clothesline and it will dry in a day or so unless we have torrential rain (or snow in the mountain areas). But I just wanted to get these out of the way, so in the drier they went. Saturday was spent at The Light Factory Art Gallery studio, doing a workshop with Sharon. We learned to draw a green tree frog from Janet Matthews. I've done two previous workshops with Janet - drawing an owl and a rainbow lorikeet. She is a well known Australian wildlife artist who does all her art work in pencils (Faber Castell mostly) and her drawings are meticulous and beautiful. She came out to our house last year to photograph Ken's Gouldian Finches, as she had never had the opportunity to get so close to them before. She has since done a stunning drawing of the finches, and it has been on display at the Light Factory gallery for the past three weeks. Guess what Ken is getting for his birthday this year? (if anyone is reading this blog and knows Ken personally, PLEASE don't give away my little secret!!) I haven't quite finished my Green Tree Frog, but when I do, I'll post a photo on my art and craft blog. So, as you can see, apart from housework and going places with Ken, quilting, embroidery and drawing is taking up my time - and it's all fun! 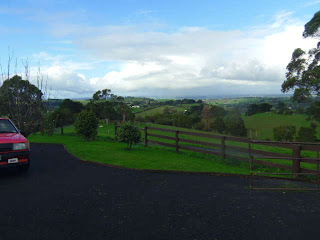 Rob was born in Korumburra.....its a beautiful place. his parents run the newsagent after the war.